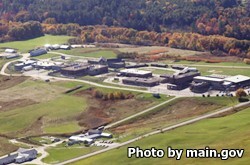 Maine Correctional Center is an adult male and female facility located in Windham Maine. This prison serves as the primary reception center for the assessment and diagnostics of many inmates in the state. It is a medium to minimum security institution that can currently incarcerate over 670 inmates. The Chaplain's Office at Maine Correctional Center offers inmates various worship services, for a wide array of religions. In addition, counseling, grief support and other programs are offered through the Chaplain's Office. While incarcerated at this prison, offenders can earn a GED and take a variety of vocational courses. All visits at Maine Correctional Center must be scheduled in advance by calling the appointment office at (207)-893-7109 Monday-Friday from 12pm-4pm. The available visiting times will depend on the inmates unit. MPU has visits Thursdays 6:30pm-7:30pm, Saturdays1pm-2pm, and Sundays from 9:30am-10:30am and again at 1pm-2pm. Hill has visiting on Wednesdays from 6:30pm-8pm, Fridays from 6:30pm-8pm, Saturdays from 12:30pm-2pm and 2:30pm-4pm, and Sundays from 2:30pm-4pm and again at 6:30pm-8pm. Women's Center has visitation on Tuesdays from 6:30pm-8pm, Saturdays from 9:30am-11am and 6:30pm-8pm, and Sundays from 9:30am-11am. The CRA (Correctional Recovery Program) and Dorm 2 (Rule Program) have visiting on Sundays from 12:30pm-2pm and Mondays from 6:30pm-8pm.